Men's lightweight crew, shown in action this fall, has outperformed nearly all of its opponents this spring. The spring season is coming to a close, and the championship picture is becoming ever clearer. On the court, on the diamond, on the course, and on the river, the Crimson has a chance to win it all. We take you through the contenders in this week’s Power Rankings. The No. 24 men’s tennis team couldn’t have asked for a much better start to the dual season: 17 wins in 18 tries. But in its second Ivy League matchup, Harvard hit a bump in the road with a 5-2 loss to Columbia. Since then, the Crimson found its winning ways once more and is in the midst of a three-game winning streak. So despite the league loss to the Lions, with two games left on the conference slate, Harvard controls its destiny—if it wins out, the Ivy title is coming to Cambridge. The stars have appear to have aligned for the women’s golf team. In a weekend when the two best players in program history didn’t crack the top 12, Harvard still managed to win the 14-team Roar-EE Invitational on April 13-14. After failing to win a tournament all last season, last weekend marked win number three for the Crimson squad, who comes into next weekend’s Ivy League Championships as the favorite. In the North Division of Ivy League softball, there’s Harvard, and then there’s everybody else. With a sweep in Friday’s doubleheader against Brown, the Crimson clinched the division crown—with six games left—for the third straight year. The second best team in the division? Brown, which sits a full 8.5 games back. Oh, and the juggernaut Harvard squad now has nice little 12-game league winning streak going. And whether it’s been Kasey (Lange) or anybody else at the bat, the Crimson has had no shortage of runs, averaging 7.64 per Ancient Eight contest. It was hardly an ideal finish to the regular season for the No. 15 men’s volleyball team. After winning 17 of its first 20 contests to open the year, the Crimson was one set away from pulling off a mammoth upset of then-No. 7 Penn State. But thanks to a choketastic display of volleyball, Harvard dropped the final three games to fall, 3-2. The next weekend, the Crimson lost in five sets again, this time to NJIT, before finishing its regular season with a 3-1 victory over Rutgers-Newark. Despite limping into the playoffs, men’s volleyball still has the second seed in next weekend’s EIVA tournament. The softball team’s 12-game league winning streak has nothing on the No. 1 men’s lightweight crew’s current run. 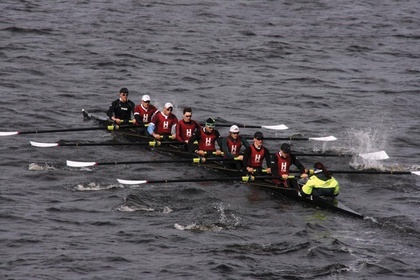 The Crimson 1V (5-0) has topped its last 24 dual opponents, including a Biglin Bowl win last weekend with a 4.2-second victory over Dartmouth. (The real story of the day was MIT, which somehow managed to lose that race by 36.3 seconds). Harvard will look to continue its streak on Saturday, when it squares off against Navy and Georgetown.